Many corporations on Wall Street are set to benefit from the proposed tax reforms — but not as much as it might seem. Gary Cohn, director of the National Economic Council and one of the “Big Six” Republicans behind President Trump’s tax rewrite, was on stage at The Wall Street Journal’s annual gathering of business executives in Washington last month defending the plan. He looked happy to be there. Both the House and the Senate were working on bills that resembled the Big Six’s outline, including the group’s call for a big cut in the corporate tax rate. The host from the Journal asked the audience for a show of hands: Who would use the tax windfall to invest more in their companies? Cohn might have thought the question rhetorical. Only a few days before, during a television appearance, he had said, “We believe that we’re going to have a very stimulative effect on the economy by lowering the business tax rate, by lowering the corporate rate, and making America competitive with the rest of the world.” Except the response from the impromptu focus group at the Journal event was muted; only a smattering of the assembly’s members indicated they would use the proceeds from a tax cut in a way that would produce a stimulative effect. Under the latest version of the bill — a compromise worked out between negotiators from the House and Senate — the federal corporate rate would reportedly drop from 35 percent to 21 percent, according to the Washington Post and several other news outlets. (When state levies are included, the U.S. statutory corporate tax rate averages to 39 percent, the highest in the Group of 20.) But thanks to a bevy of deductions, few American corporations actually pay 39 or even 35 percent. Estimates vary, but Kent Smetters, the Wharton School professor who runs the Penn Wharton Budget Model, said in an interview that he reckons the average effective rate that U.S. corporations pay is around 22 percent. That could explain the lack of enthusiasm that Cohn saw at the Journal event. Another complicating factor is that companies that pay the corporate rate account for only about half of total business income. The rest is generated by “pass-through companies,” which tend to be smaller businesses where the owner or owners are taxed at personal rates. 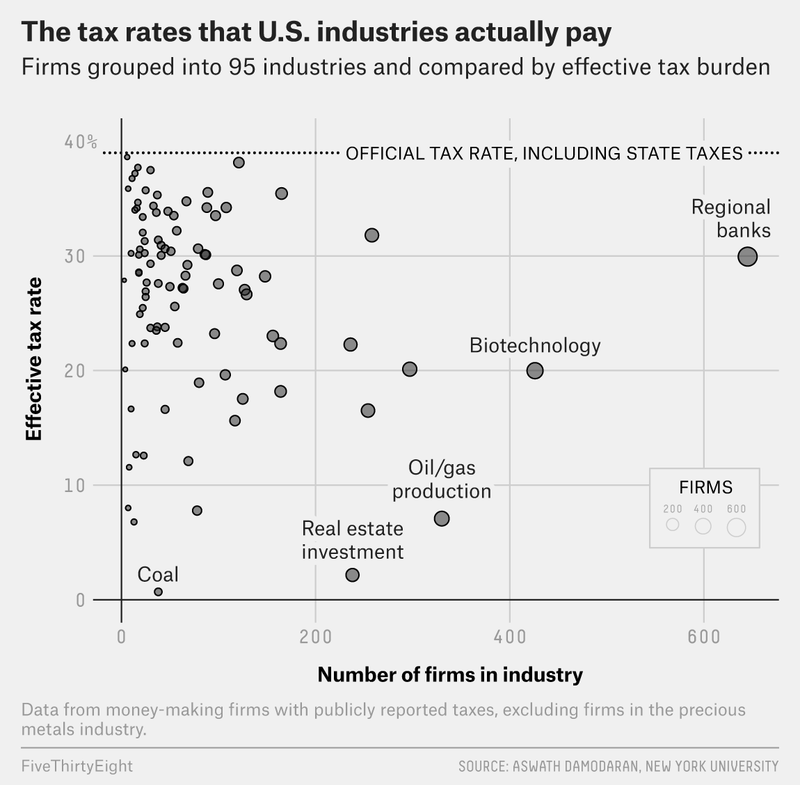 The variation in the tax rates companies actually pay is a testament to lobbyists, who for decades have successfully coaxed and cajoled politicians to create various industry-specific loopholes in the tax code. The House and Senate bills both proposed ending some of these breaks, a trade for a lower corporate rate and potentially less paperwork to fill out. The Senate legislation, for example, would reduce the total amount of interest payments that companies could deduct. One provision of the tax bill that will likely irritate anyone harmed by the financial crisis: The five biggest banks would have saved more than $11 billion in 2016 if they paid an effective tax rate of 20 percent, which was the rate originally proposed in the bills passed by the House and Senate. That was significantly more than any other group of publicly traded companies would have saved, according to an analysis by S&P Global Market Intelligence. Of course, banks are just one industry, and it’s impossible to use one type of company to estimate hiring practices across all U.S. industries. That said, banks are a good starting point, as they make up a large proportion of the U.S. economy; calculations at Politifact suggest that the value of the assets held by some of the country’s largest banks is equivalent to 60 percent of U.S. gross domestic product. Banks are also a good example because Trump’s policies have been expected to be favorable to them — if the benefits are going to help any industry, it ought to help this one. Indeed, Republicans are struggling to convince those outside the party that the GOP hasn’t succumbed to magical thinking about the power of tax cuts. Only a quarter of respondents to a Quinnipiac University poll released last month said they supported the plan, while 52 percent said they opposed it. “Worst poll numbers for a tax cut I’ve ever seen,” tweeted Bruce Bartlett, an economist who advised former presidents Ronald Reagan and George H.W. Bush. According to an analysis by the Congressional Budget Office using for data for 2012, the median of the average corporate rate paid in 17 big economies was 20.4 percent. Burger King is an example. In 2014, Burger King’s owners bought Tim Hortons, the Canadian coffee-and-donut chain, and relocated the headquarters for the iconic American brand to Ontario. Restaurant Brands International, the parent company formed when the two brands merged, pays an effective tax rate in Canada of about 20 percent. Assuming the economy grows after the Republican tax plan becomes law, it will be unclear how much of that growth is the result of lower taxes — and how much is the result of economic momentum that gathered pace at the end of Barack Obama’s presidency. Lately, blue-collar wages have been rising, and strong overall economic growth has dropped the unemployment rate to its lowest point since 2000. “Labor markets determine salaries, not tax rates,” wrote David Mendels, former chief executive of the software company Brightcove, in a post on LinkedIn. A few industries included in our average, like coal and real estate investment, pay lower rates, as you can see on the chart below. We are excluding one industry in Damodaran’s data set from our average: the precious metals industry. According to Damodaran, this is an unusual industry with a uniquely high effective tax rate. Most publicly traded companies in this industry report no or negative income, leaving just a few who pay a very high rate.